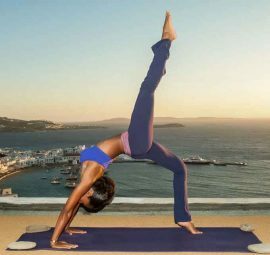 Vibrant, sun-kissed & cosmopolitan "Island of the Winds"
Mykonos is a world famous travel mecca and the ultimate dream of every cosmopolitan vacationer. Every summer thousands of visitors from all over the world wander on the narrow streets of its charming Chora to find the most exquisite brand boutique shops, swim in its crystal waters or enjoy sun kissed beaches. As the night falls, the island draws even more worldwide attention for its vivid nightlife and party atmosphere, offering variety of chic restaurants, clubs or cocktail bars. It is not by chance that Mykonos is one of the most popular destinations for celebrities and the world's elite. 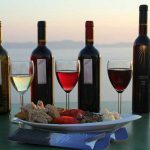 The “Diva” of the Aegean offers the best tourist amenities and meets even the most demanding needs. Here you will find luxury hotels, high end restaurants & bars, designers’ boutiques, after hour parties with world famous DJ’s and fully developed beaches. However, the island of Mykonos also hides a less seen face for the ones looking for a more peaceful state of mind. A place with archeological, natural and traditional facets, Mykonos combines the jet set venues with rich archeological heritage and eternal Cycladic beauty, which makes it a thrilling travel destination. 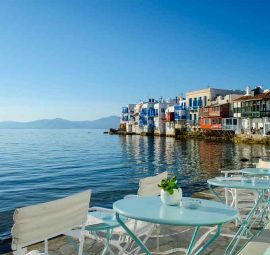 Mykonos Town or Chora: Famed for its picturesque Cycladic architecture and relentless party scene, Mykonos town, with its hip boutique hotels, chic local taverns, bohemian bars, lively clubs and modern-meets-rustic vibe is by far the most cosmopolitan town of the Greek islands. 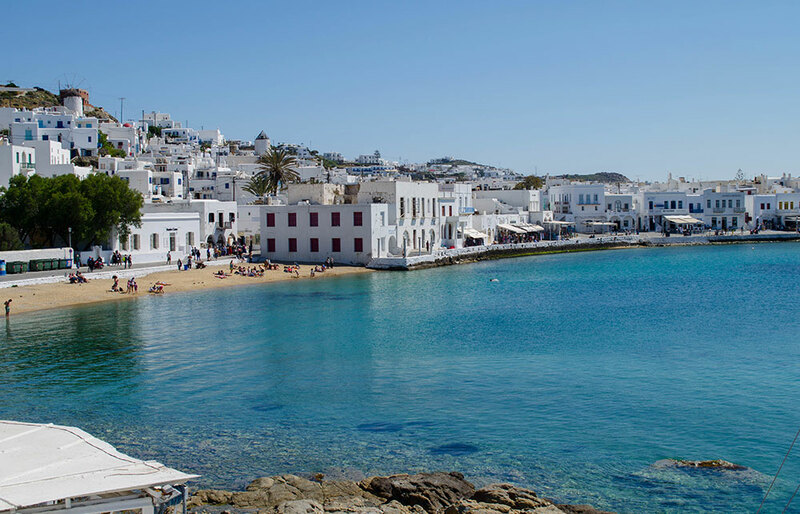 A stroll through the labyrinthine streets of Mykonos town, once built to confuse the unwanted visitors and protect the village from pirate’s attack, is what really makes a trip to Mykonos complete. The Windmills: Mykonos famous windmills are the landmark of the island. While the five windmills in the hill of Chora get all the attention, visitors can see a total of 16 windmills on the island. 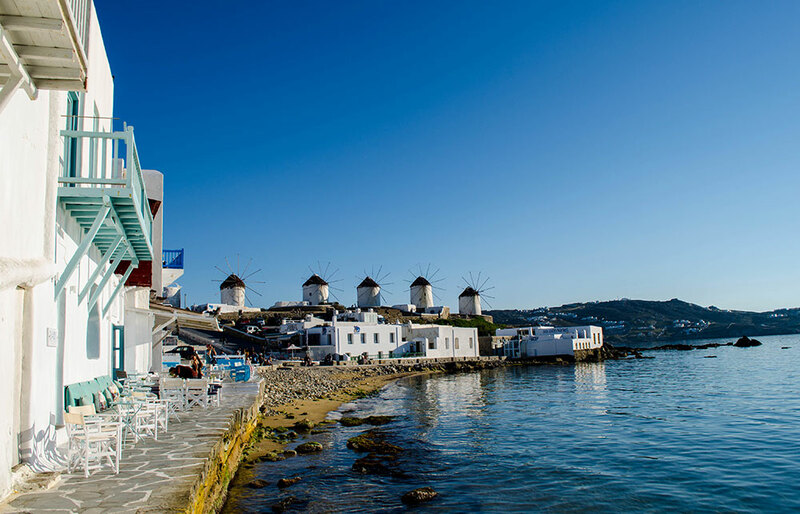 With Mykonos being the ‘island of the winds,’ these windmills operated from the 16th until the 19th century, capitalizing on the region’s winds for agricultural production. After the introduction of electricity the windmills lost their financial power but became one of the most popular monuments of the Cycladic islands. Many of the 16 old windmills in Mykonos are still standing and are thoroughly renovated, and one is currently a museum. Little Venice: Little Venice is one of the most photographed neighborhoods in Europe, located on the west side of Chora. Its characteristic architecture, whitewashed houses with colorful windows and wooden balconies that hang over the sea, have inspired many artists and romantics, and won over many unenthusiastic travelers, as its elegant character and amazing sunset view disarms even the most discerning ones. This special area was built in the 18th century and was used to quickly load and unload goods onto the boats during pirate raids, while its mazy narrow streets where structured to confuse the pirates than managed to set foot on the island. Today, many old houses in Little Venice have become bars and restaurants where you can sit and admire the romantic sunset view while enjoying a cocktail in this postcard-perfect neighborhood. Matoyanni Street: The heart of the island is known by locals and tourists to be Matoyianni Street in Mykonos Town. The street is dominated by designer outlets, jewelry stores, art galleries and souvenir shops, selling luxury products to high end customers. Many well known celebrities have been spotted shopping here. During the summer months most stores are open until midnight. In Matoyanni street you will never be short of things to do after hours. Some of the most popular nightspots of the island are located here, offering excellent dining and entertainment choices until the early morning hours. Petros The Pelican: The pelican called Petros has been the official mascot of Mykonos since 1954. Petros was found wounded by a fisherman off the coast of Mykonos. He was nursed to health and surprisingly never left the island. He made Mykonos his home and gradually became a celebrity. When Petros died, the whole island went into mourning and Jackie Kennedy compassionately donated another pelican to the island. Today a pink pelican can be seen wandering around Mykonos old harbor. 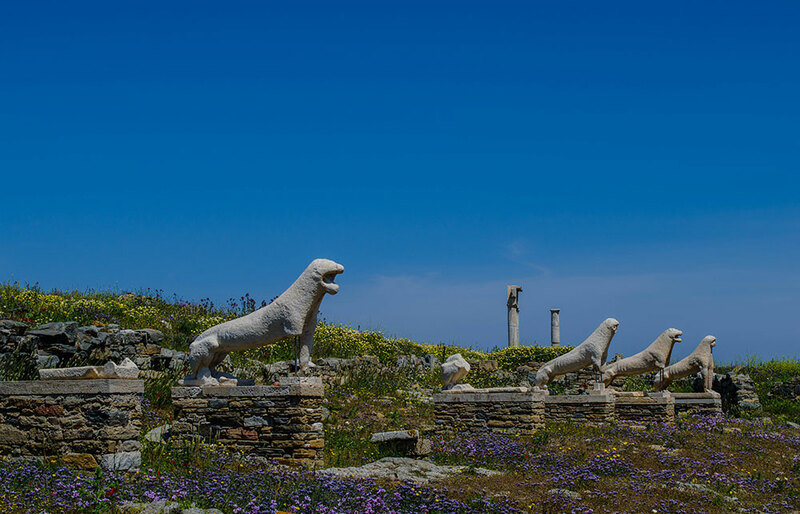 Delos Island (the uninhabited Cycladic island): Delos islet is one of the most important archeological sites in Greece. It is located a few miles south-west of Mykonos and has become a part of the World's Cultural Heritage and is protected by UNESCO. 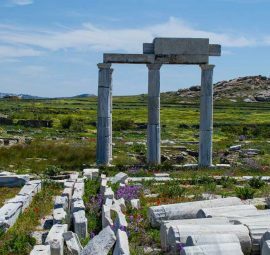 Delos is the birthplace of Apollo, god of music, truth and light and his twin sister Artemis, goddess of hunting. During the Ancient Time it was considered the most important Hellenic sanctuary. The island has significant history tracing back to the 3RD millennium BC. Excavations have brought rich archaeological finds to light and are continued to be carried out by the French School of Archaeology. 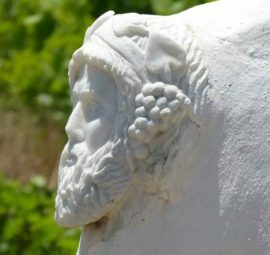 The island's ruins - Doric temples, markets, an amphitheater, houses with mosaics and the iconic Terrace of the Lions statues - are spread about all over the island, giving testimony to the island's glorious history. The Archaeological Museum of Delos and the National Archaeological Museum of Athens also display many artifacts excavated from the site. A trip to Delos is highly recommended. Delos site is open for public during the daytime and no visitors can stay overnight. Armenistis Lighthouse: The Armenistis Lighthouse is located in the north-western side of Mykonos. It was built in 1891 after the tragic sinking of the English steamboat VOLTA in 1887. It is 19 meters high and offers unique view. This legendary lighthouse is beautiful scenery to visit, as this eye catching octagonal stone tower is still in operation and managed by the Hellenic Navy's Hydrographic Office. Its focal plane is 184 meters with a white beacon that flashes every 10 seconds. 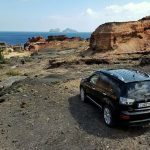 In order to visit the Armenistis lighthouse, you have to take the coastal roads towards Agios Stefanos village. The amazing view of the island of Tinos is worth the trip. Panagia Paraportiani Church: Panagia Paraportiani Church is the most famous church in Mykonos and one of the most photographed churches in Greece, due to its interesting whitewashed architectural structure. 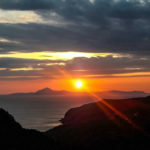 It is located in the neighborhood of Kastro, right by the sea. The name “Paraportiani” actually means “the side door”, and refers to its location that was next to the side door of the medival castle “Kastro”. The special thing about this church is that it is actually a complex of five small churches, one right next to the other. The church of Agios Efstathios stands in the center, surrounded by the churches of Agios Sozon, Agios Anargiros and Agia Anastasia. On top of the four stands the church of Virgin Mary, which looks like a dome. Besides its beautiful architecture, Panagia Paraportiani has striking sea view and offers idyllic pictures scenery. Museums: Mykonos is a place with great historical interest. Mykonos Town has many museums which present the island’s rich history and tradition. A visit to its museums is highly recommended. Agricultural museum of Mykonos (Mykonos Town): is housed in an old windmill and exhibits a rich collection of agricultural tools used for the production of farm products. Archaeological Museum of Mykonos (Mykonos Town): one of the most important museums in Cyclades. It holds a vast collection of exhibits from the Hellenistic period and prehistoric times including vessels, statues and columns. Folklore Museum of Mykonos (Kastro neighborhood): exhibits include typical Mykonian furniture of the last century, icons, photos, post byzantine sculptures and historical documents. House of Lena’s (Mykonos Town): a traditional 19th century middle-class Mykonian house. Maritime Museum of Mykonos (Mykonos Town): presents the nautical history of Mykonos through historic ship documents, rare engravings, maps and ancient tools. Municipal Library of Mykonos (Mykonos Town): is housed in an old mansion and has a collection of more than 6.000 volumes of literatures and history, mostly in the Greek language. 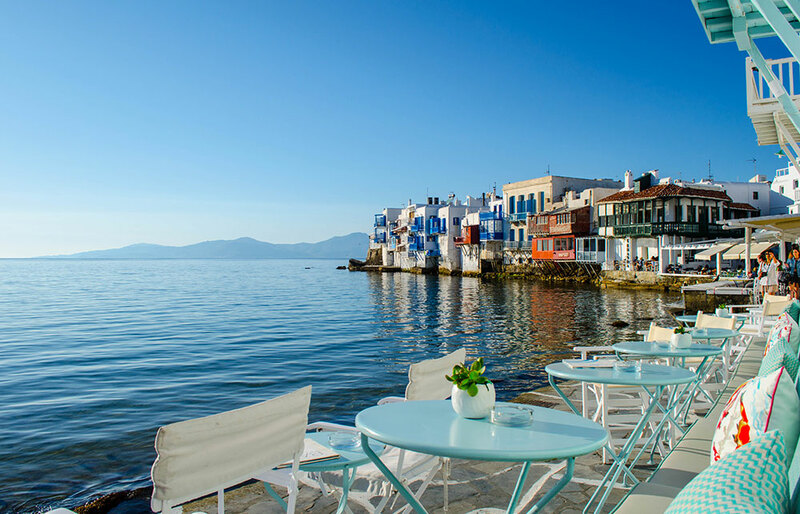 Mykonos capital, called Town or Chora, has an elegant authentic Cycladic beauty in which glamour meets simplicity. The beautifully persevered Cycladic architecture creates a distinctive sophisticated character. 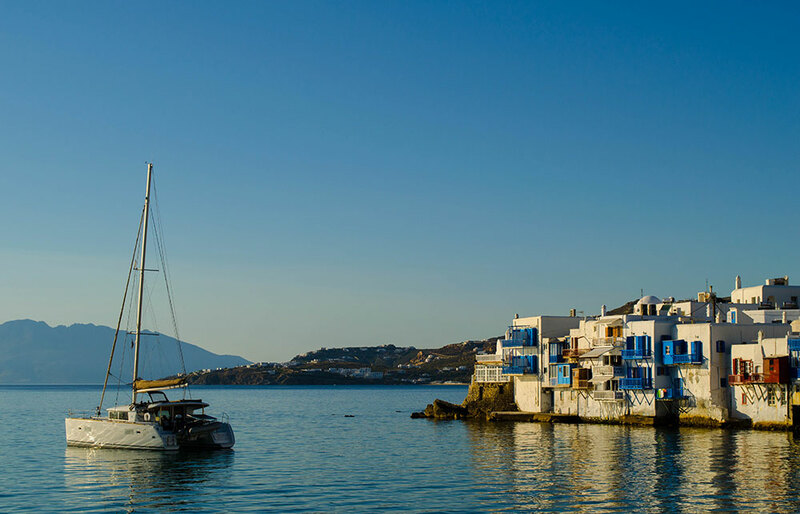 From the picturesque whitewashed cubic houses and the beautiful paved alley of Matoyanni, to the wooden balconies that hang over the waves in Little Venice and the traditional windmills, Mykonos Chora is a testament that Cycladic beauty is timeless. A walk through Chora will put in your way the most significant places to visit in Mykonos. The famous windmills, trademark of the island, are standing on a hill overlooking the town in their distinctive form and white figure. Right across is one of the most picturesque parts of the island, the wooden balconies of Little Venice that hang over the waves and offer a very privileged view of the sun setting on the sea. As you walk through the crowded alleys of Chora you will find popular bars, clubs & restaurants, designer shops, beautiful chapels, as well as the emblematic monument of Panagia Papaportiani Church, which is worth a visit. Of course, you will run into the proud successor of Peter the Pelican, the official mascot of the island since 1954, who usually wonders around Little Venice. But keep in mind that even an experienced Mykonian may take a few wrong turns in the endless small streets of Chora that form a remarkable labyrinth. They were originally designed to confuse pirates back in the day, but today form a mysteriously attractive maze you’ll love to get lost in. Ano Mera is the second bigger village in Mykonos. Is a large settlement where many local Mykonians live. It is a quiet village, with a few luxury hotels and rooms to rent, where locals continue their everyday life away from the touristic crowds. 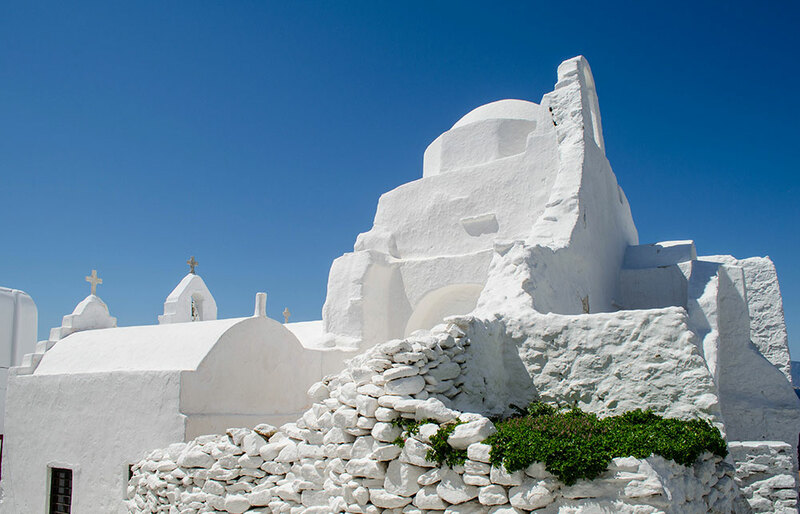 Near Ano Mera there is a traditional Monastery dedicated to Panagia Tourliani, the protectress of Mykonos. It houses a superb collection of icons holy vessels and vestments, especially recommended to travelers interested in churches and monasteries. One kilometer away is the 12th-century Monastery of Paleokastro, in one of the greenest spots on the island. Agia Anna Beach: is a hidden sandy beach, only a few minutes’ walk from Kalafatis beach. It takes its name from a small chapel in the area. It is a calm sandy beach, very quiet and authentic with only few umbrellas and amenities. It is a nice alternative to the crowded southern beaches. The beach is accessible by car and bus. From Agia Anna, you can walk to Platis Gialos and Paraga Beach. Agios Ioannis Beach: situated 5 km south of Mykonos town, Agios Ioannis is a small quite beach ideal for families or incognito magnates. It has soft sand, shallow crystal blue waters and a few taverns close by for lunch. A good place to get away from it all and enjoy a wonderful sunset view over the island of Delos. Some of the best resorts in Mykonos are located here. Agios Sostis: is one of the most remote beaches of the island that has managed to stay unspoiled. It is a quiet sandy and pebble bay without any kind of amenities that creates the visitors a feeling of freedom. 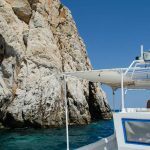 The only way to reach Agios Sostis is by car. There is a small taverna hidden on the footpath leading to the beach, perfect for a visit after a hot day in the beach. Agrari Beach: is a quiet, nudist friendly beach with a nice beach bar and a water sport area. It is located right next to Elia and the two beaches together form a huge sandy beach. There is no direct bus stop in Agrari, but it can be reached by car, boat or foot from Elia. As famous as the beach it is the Names restaurant by the sea, an exclusive establishment with outdoor seating on its own private beach. The beach is 5km from Mykonos town and is reachable by local bus. 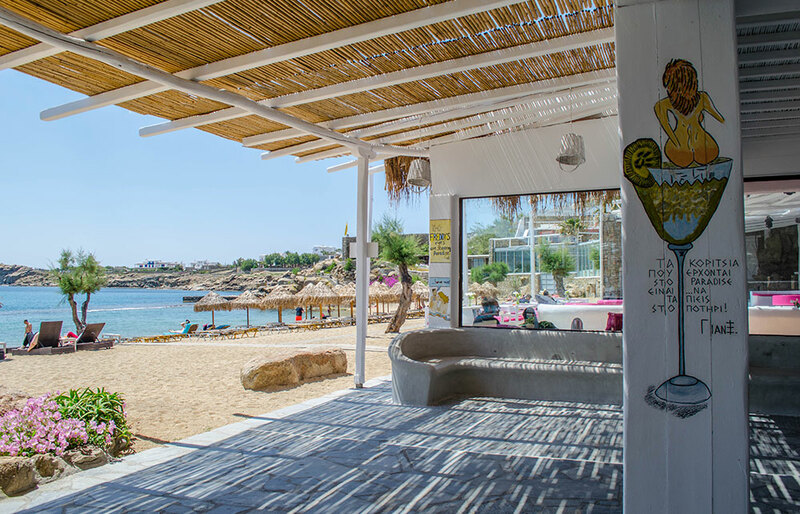 Elia Beach: is the largest sandy beach of Mykonos, quite cosmopolitan with many accommodations and dining choices. The beach attracts a mixed crowd, with popular meeting spots for the gay crowd. Lots of nudists also come here. Elia has a watersport center, many accommodations and is walking distance from the island’s water park. Elia can be reached by bus or boat. Fokos Beach: is an isolated, tranquil beach on the northern side of the island. Due to its long distance from the crowded southern beaches, in Fokos you can enjoy a quite swim, even in a high season, and some horseback riding. There are pebbles and sand at parts making it a good place for snorkeling also. The beach is unorganized and there is only one tavern in the region. Fokos can be reached by private means only. Ftelia Beach: is a beautiful beach with smooth yellow sand and wild winds particularly famous among windsurfers. Although the beach is unorganized, there are some accommodations and tavernas nearby, while not far you can find cart and paintball field. The beach is relatively uncrowded due to the blowing winds. The beach can be reached by car. The bus will leave on the main road and there is a 10 min to down to the beach. Kalafatis Beach: is very popular among wind-surfers. The beach is favored by the winds and has its own wind surfing center, where you can rent equipment. Wind surfing funs can also watch organized competitions here. On the beach, there is also a beach volley court and a water sports area. There also a lot of amenities on the beach such as hotels, restaurants and beach bars. Kalafatis is easily accessible by car and bus. Kalo Livadi: is one of the longest beaches in Mykonos and is very popular with locals and families. It is located between Elia and Kalafatis beach. The waters are shallow enough for children and there are various amenities around the beach. Its beautiful clear waters and golden sand is an ideal destination for people who looking to swim away from the noisy crowds. In Kalo Livadi there is always space to lay your towel in the sand. The beach is also known to have some of the most elite restaurants and all day beach bars in the island. Kapari: is a small secluded beach that offers amazing sunset view. It is one of the few unorganized beaches located behind the chapel of Agios Ioannis, relatively close to Mykonos Town and a perfect way to end your day. Lia Beach: is a small quite beach with clear waters and great environment. 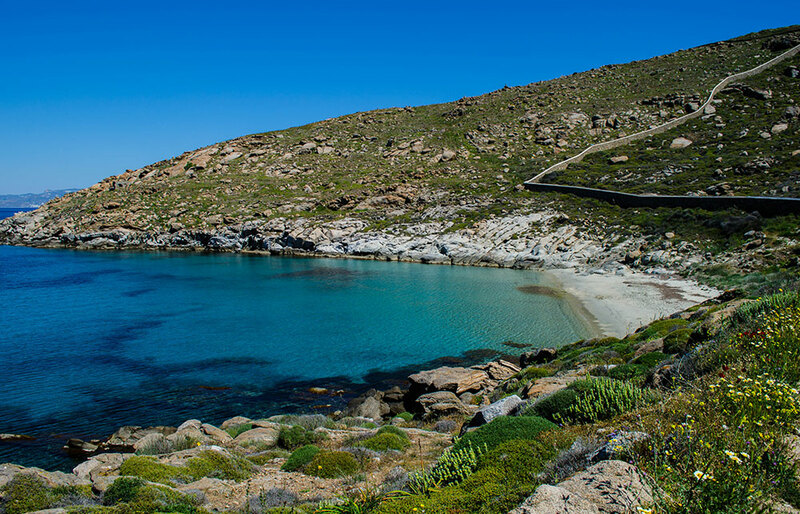 It is located 14km from Mykonos Town and can be reached only by car, which is probably why it more peaceful. Its blue waters and white sand create a wonderful swimming combination extremely popular among locals and Greeks. The beach is fairly developed with umbrellas, sun beds, a beach bar and few tavernas to choose from. Ornos Beach: is only 2 km south of Mykonos town and is very popular. 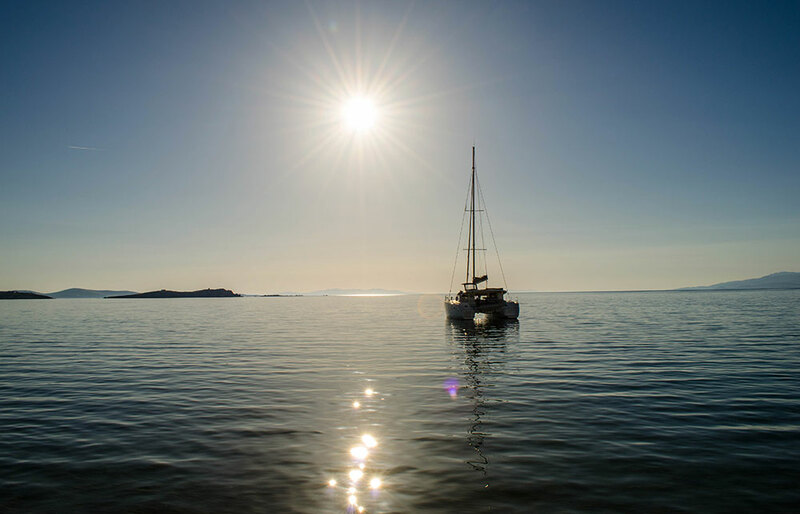 Ornos is a beautiful sandy beach, family friendly with nice atmosphere that provides a great anchor for yachts. It is surrounded by a large choice of accommodations, bars, cafes, tavernas and great fish restaurants. Access to and from town is easily made by frequent bus service. Panormos: is a remote and unorganized beach located on the northern side of the island. 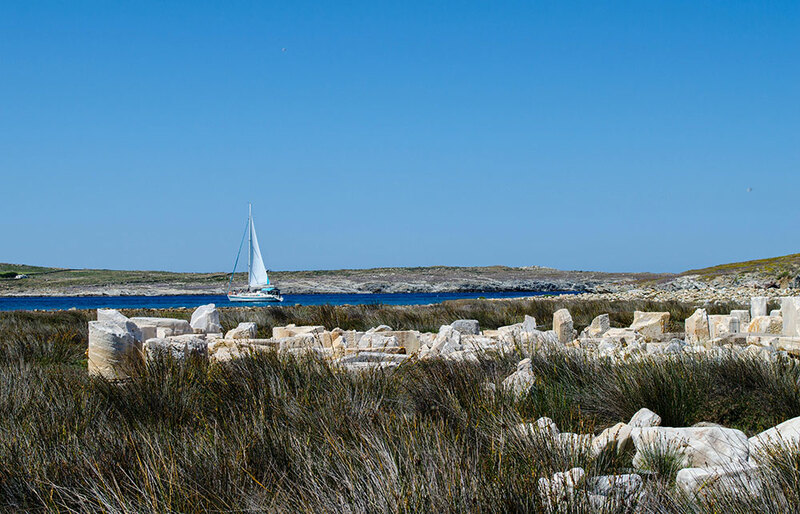 Panormos is a calm beach, protected from the southern winds. The beach is popular to families that usually stay on the left side of the beach, where on the right side nudism is quite common. On site there is a beach bar, a taverna and a hotel. Panornos has no bus service available. It can be reached by car, but is definitely worth it. Paradise Beach: Is probably the most famous beach in Mykonos, universally featured in some of the wild parties’ internet photos. In Paradise beach you will find all kinds of amenities, rooms, apartments, camping, restaurants, snack bars, club, pool, mini market, water sports, bungee and much more. Here the party never stops! People from all over the world come here to party at the famous Cavo Paradiso, one of the most impressive club venues globally, regularly voted in the top club annual lists. There is always some special event of happening, abundant alcohol and loud dance music. By night, the whole beach transforms into a huge club and people from all around the world dance until dawn. Paradise beach is reachable by a footpath from Platis Yialos, by bus or by sea-taxi. Paraga Beach: is a very picturesque spot with a party atmosphere, where music can get rather loud. Some of the best beach party clubs are located here. Paraga is a combination of two beaches separated by a headland forming a large beach. There are various amenities around them. The beach can be reached by bus, by a 15min walk from Platis Gialos or by sea – taxi from Super Paradise Beach. Platis Gialos Beach: is a very popular beach on the south side and one of the longest in Mykonos. It’s beautiful golden sand and turquoise waters attract thousands of people every summer. Platis Gialos offers water sports facilities and many accommodations, restaurants and bars. It is connected by boat (sea-taxis) with the beaches of the southern coast, which are Paranga, Agrari, Elia, Paradise and Super Paradise, and can be reached by regular bus service from Mykonos town. Psarou Beach: is famous for attracting celebrities from all over the world. It’s the place to see and to be seen. Locals and VIP visitors guard it as a tranquil place where crazy partying is frowned upon. In high season you might have to bribe your way to gain a spot on the beach. Super Paradise Beach: is just as famous as its neighboring Paradise beach, and is considered one of the most beautiful beaches in Greece. Super Paradise is extremely popular with the up, hip, trendy and gay crowds. The beach is less organized than Paradise and has beautiful crystal blue waters and soft golden sand. In the evening the whole beach becomes a party scene with loud music and a lot of dancing. There is no direct bus stop to the beach, but there are sea-taxis from Plati Gialos and Paradise beach. In Greek mythology Mykonos takes its name after its first ruler Mykons, a local hero who was considered to be the son or grandson of Apollo. The island is said to be the location for many great battles. Here Zeus fought the fearful Titans and Hercules said to have killed the invisible giants after luring them from the protection of Mount Olympus. In fact, it is even said that the large rocks which are scattered around the island are actually the petrified corpses of the Giants. Legend states the Delos, the island of Sun, appeared suddenly in the middle of the sea when the pregnant Goddess Leto, granddaughter of Uranus (Heaven) and Gaia (Earth), was being pursued by the jealous Hera because of Leto's affair with Zeus, and was looking for a safe place to give birth to her twins Apollo and Artemis. According to Greek Mythology the Cyclades were named after the world “kyklos” which means circle and refers to the islands forming a circle ("circular islands") around the sacred island of Delos. 11th century BC: The Ionians chose to establish communities here. Back then the nearby island of Delos was highly populated, which made Mykonos an important place for supplies and a transit spot when travelling out of Delos, only 2 km away. It was, however, during ancient times a rather poor island with limited agricultural resources and only two towns. Its inhabitants were pantheists and worshipped many gods. 12th century AC: Mykonos was occupied by the Romans (Byzantine Empire) until the 12th century. Around the early tenure of the Byzantines (6th century) Moni Panagias Tourlianis was build in the village of Ano Mera. 13th century AC: In 1204 Mykonos came under the control of the Venetian Andrea Ghisi. Catalans ravaged the island at the end of the 13th century. 14th century AC: Mykonos was given over to the direct Venetian rule in 1390. 16th century AC: Mykonos was attacked by Hayreddin Barbarossa in 1537, while the Venetians still reigned. 18th century AC: The last Venetians with drew definitively from the region in 1718after the castle of Tinos fell to the Turks. Mykonos prospered as a trading center up until the end of the 18th century, attracting many colonies of immigrants from nearby islands and regular pirate raids. As a result, the maze of alleyways in Mykonos Town was created to confuse potential raiders and Little Venice houses were constructed with their balconies overhanging the water, for sailors to quickly load and unload goods onto the boats. 19th century AC: Mykonos played an important in the Greek Revolution in 1821 against the Ottoman Empire, with Manto Mavrogenous, national heroine with Mykonian origin, sacrificing all her family’s wealth for the Greek cause. In 1830 Greece became an independent state. A statue of hers sits in the middle of Mando Mavrogenous square in Mykonos Town. 20th century AC: The island’s economy was affected by the opening of the Corinth Canal in 1904 and the First World War, causing many Mykonians to leave the island to find work in the mainland of Greece and other foreign countries. 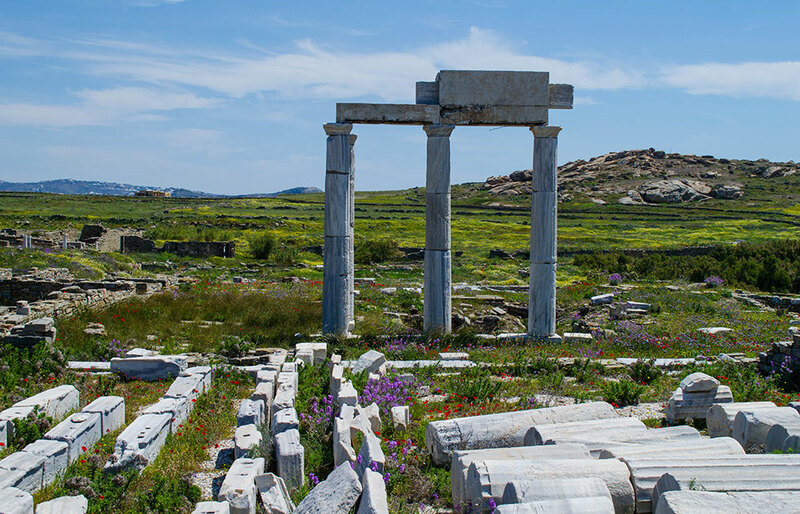 Tourism started to dominate the local economy, especially after the important excavations of the French School of Archeology began in Delos in 1873, which drew the attention of a lot of history and mythology lovers. In the 1930’s many famous artists, politicians and wealthy Europeans were spending their vacation in Mykonos island and Mykonos quickly became an international hot spot and has not stopped since. 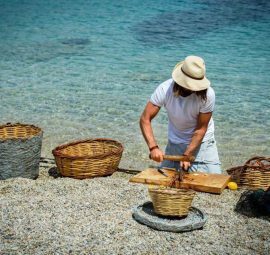 Agioi Apostoloi / Fishermen Festival: On the 30th of June there is a great feast in Mykonos Town dedicated to fishermen where seafood is offered. Agia Paraskevi: On the 26th of July is the celebration of Agia Paraskevi, Protector of the Eyes and Sight. 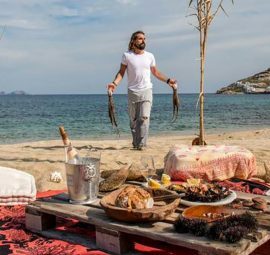 Panagia Tourliani: On August 15th, locals celebrate Panagia Tourliani, the Patron Saint of Mykonos, by having great feast in the village of Ano Mera. 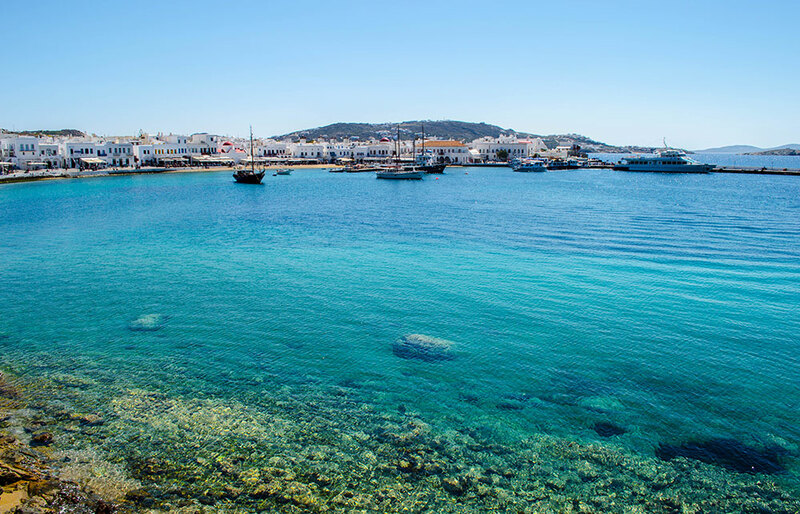 During the summer months, there is always something to see and a somewhere to be in Mykonos. The island becomes the scenery for countless open-air concerts, theatrical performances, art exhibitions, dance festivals, parties etc. Famous artists form all around the come to share their art in Mykonos. So make sure to check the island’s schedule before you visit. Cavo Paradiso Events: Cavo Paradiso is regarded by music industry publications, artists and clubbers, as one of the most impressive club venues globally. It is regularly voted in the top club annual lists and every summer has an extensive list of events that people from all over the world out. Make sure you check on its website schedule. Traditional Harvest Festival: Every second Sunday in September, to celebrate the harvest in Mykonos, winemakers gather to tread the grapes at the wine press, keeping alive a century’s old tradition. Musician play folkloric music and sing songs, part of the enduring culture of the Cycladic islands. XLsior Gay International Festival: During August Mykonos holds one of the most ne of the most exclusive international Summer Gay Festivals in the world. Exclusive shows, parties, original clubbing events, Dj sessions and performances by special guest stars at Mykonos' most interesting venues.